Heyyyy!!! I'm trying something a bit outside my comfort zone! Piping flowers!! I'm obsessed with Molly Yeh (WHO ISN'T?!! ), and finally felt brave enough to try my hand at piping a few of my own flowers out of frosting. Honestly, it was easier than I thought, although it is time consuming! I love that there is really no risk here besides wasting your own time. Ha! And I'm obviously not scared of that! Now, I'm not offering a full flower tutorial here (yet!! ), since I'm still such a newbie. But I watched a lot of youtube videos, practiced a lot, and just scraped the ones I didn't like back into the bowl of frosting. Win! Seriously, pipe a bunch onto parchment, and just redo them as you find a technique that works for you. The hardest part is keeping your frosting at the right consistency, so doing this on a super hot day is a no no unless you have A/C! (Or unless you're a late night baker like I am...haha!). If you're frosting starts losing shape, then simply pop it back in the fridge to firm up a bit. Now this recipe came from the genius of Adrianna from A Cozy Kitchen! 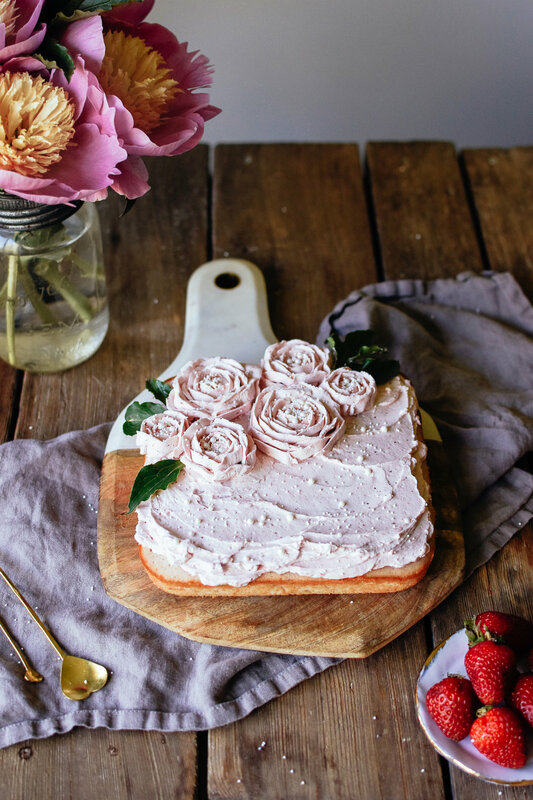 She shared a strawberry sheet cake with rhubarb meringue frosting, and I adapted it a bit to make both with roasted strawberries. It is divine! 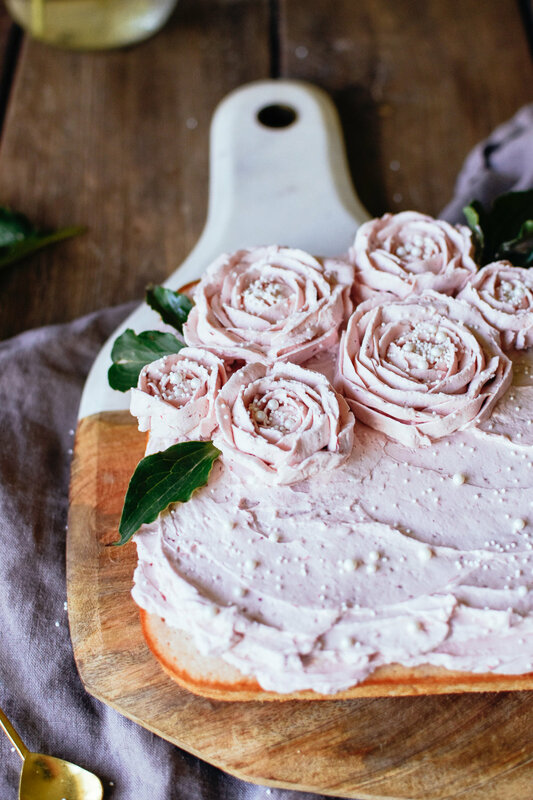 The cake is delightfully fluffy, and the frosting is an absolute dream. I always love trying other bloggers recipes, and need to do it more often! Preheat your oven to 375 degrees F. Line a baking sheet with parchment paper. Spread strawberry slices onto the parchment, and sprinkle evenly with sugar. Roast them for about 10 minutes, until berries are soft and juicing. Set aside to cool for 5-10 minutes. Then place them in a blender and blend until smooth. Keep in the fridge until ready to use. Preheat oven to 350 degrees F. Grease an 8x8 pan, and cupcake pan, and set aside. Alternatively, use a 9x13 baking pan for a sheet cake to use all of the batter for the cake. In a medium bowl, combine the cake flour, baking powder, and salt. Set aside. In a large bowl, cream together the butter and sugar. Beat for 2-3 minutes, until mixture is light and fluffy (don’t skip this!). In a small bowl, whisk together the milk, egg whites, vanilla, and strawberry puree. Turn your mixer on low, and alternate between adding in dry and wet ingredients until everything is combined. Pour the batter into the prepared pan(s), and bake for 20-25 minutes (15-20 for cupcakes), or until an inserted toothpick comes out clean. Fill a medium saucepan with a few inches of water, and place a clean metal bowl on top to create a double-boiler. The water shouldn’t be touching the bowl! Add the sugar and egg whites together and whisk briefly to combine. Heat the mixture until it reaches 155-160 degrees F to ensure the egg whites are safe. Remove from heat and use the whisk attachment on your mixer to beat on high for 6-8 minutes. The mixture should be thick and shiny, and have come down to room temperature. Switch the whisk to the paddle attachment/regular beaters, and turn to low. Add in butter one tablespoon at a time, and mix until fully incorporated before adding more in. Finally, add in strawberry puree, and mix until smooth. *Frosting may turn soupy at any point during the butter or rhubarb additions, so simply place in the fridge for 10 minutes and try mixing it again. The most common culprit is that the frosting has mixed up too much. Keep faith, and keep mixing. Place back in the fridge as necessary. *Tip from Adrianna: if the frosting looks curdled: simply remove 1/4 cup of frosting and microwave for 20 seconds or so until it’s smooth again, and then slowly pour back into the rest of the frosting while mixing on low. This should smooth out the frosting! Once the cake is completely cool, spoon the frosting over top, and use an offset spatula, or simply a butter knife, to smooth it out and add in some swoops and sprinkles. If you want to make flowers, place the frosting into a piping bag with a tear drop tip (I used a Wilton #103). Practice on small squares of parchment until you’re happy with the outcome. Otherwise, simply scrape the frosting back into the bowl and start again. I placed my finished flowers on a baking sheet, and kept it in the freezer as I worked. The flowers freeze wonderfully, and are much easier to work with. Let them fully harden, and then remove from freezer, and gently remove parchment paper, and place onto your cake. 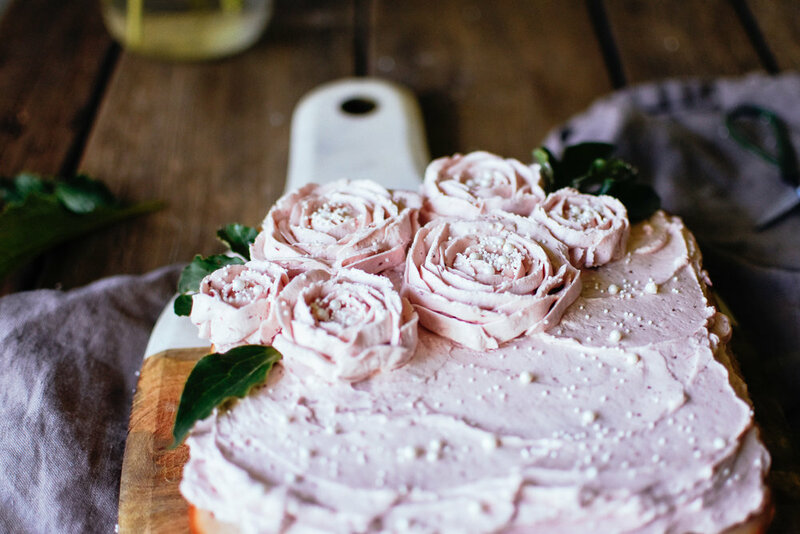 Tip: Keep extra flowers in the freezer for the future! They keep amazingly well, (I still have a few in the freezer), and they’re great to pull out when you’re short on time, but want a cake to look extra special! Note: For the cupcakes, I cut off the tops and filled them with the leftover strawberry puree…such a fun surprise!